, corresponding to C terminal amino acids 1242 - 1255 of Human c-ErbB2. For paraffin sections, we recommend pretreating with a pressure cooker, but trypsin and heat will also work well. Including 0.05% saponin during staining of paraffin sections may help reduce background. In one study ductal carcinomas in situ displaying large-cell, comedo growth type, were stained while none of 16 ductal carcinomas in situ of small-cell, papillary, or cribriform growth type were stained by this antibody. MO 01/02/07: update consignment level to 0 following settlement of consignment stock in January 07. Our Abpromise guarantee covers the use of ab16901 in the following tested applications. 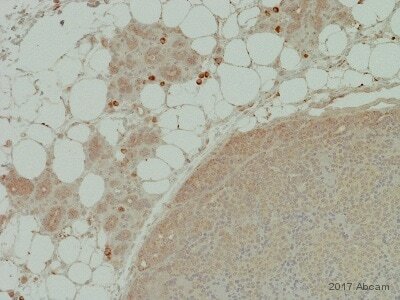 IHC-Fr Use a concentration of 2.5 µg/ml. WB Use a concentration of 2.5 µg/ml. Detects a band of approximately 190 kDa (predicted molecular weight: 138 kDa). IP Use 1µg for 106 cells. Immunohistochemistry (Formalin/PFA-fixed paraffin-embedded sections) - Anti-ErbB 2 antibody [3B5] (ab16901)This image is courtesy of an anonymous abreview. 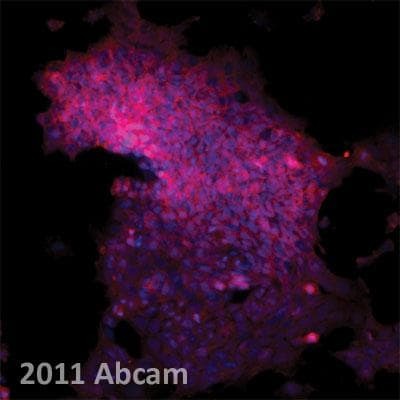 Immunohistochemistry (Formalin/PFA-fixed paraffin-embedded sections) analysis of human breast cancer tissue sections labeling ErbB 2 with ab16901 at 1/400 dilution. the tissue was fixed with formaldehyde; heat mediated antigen retrieval was performed using a acetate buffer pH6. 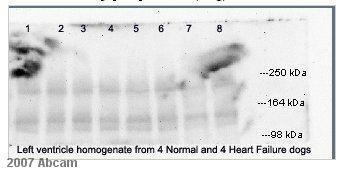 An undiluted goat anti-mouse HRP conjugated seconday antibody was used. 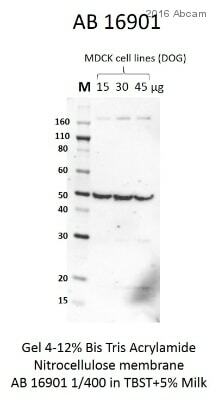 Western blot - Anti-ErbB 2 antibody [3B5] (ab16901)This image is courtesy of an anonymous abreview. Blocking: 5% milk for 1 hour at 25°C. Immunohistochemistry (Formalin/PFA-fixed paraffin-embedded sections) analysis of human Mamma tumor Her2Neu tissue labeling ErbB 2 with ab16901. 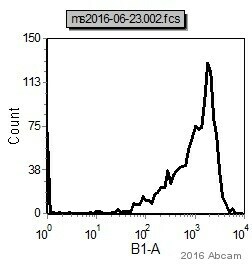 Overlay histogram showing LoVo cells stained with ab16901 (red line). The cells were fixed with methanol (5 min) and then permeabilized with 0.1% PBS-Tween for 20 min. 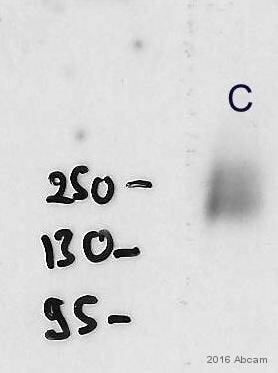 The cells were then incubated in 1x PBS / 10% normal goat serum / 0.3M glycine to block non-specific protein-protein interactions followed by the antibody (ab16901, 1/100 dilution) for 30 min at 22°C. The secondary antibody used was DyLight® 488 goat anti-mouse IgG (H+L) (ab96879) at 1/500 dilution for 30 min at 22°C. Isotype control antibody (black line) was mouse IgG1 [ICIGG1] (ab91353, 2µg/1x106 cells) used under the same conditions. Acquisition of >5,000 events was performed. This antibody gave a positive signal in LoVo cells fixed with 4% paraformaldehyde (10 min)/permeabilized with 0.1% PBS-Tween used under the same conditions. 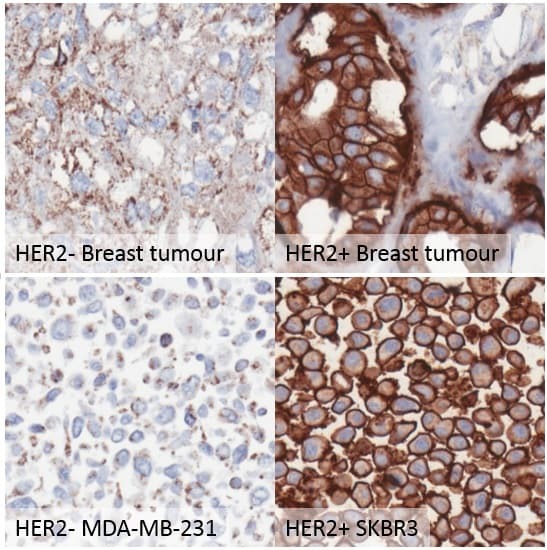 Immunohistochemistry (Formalin/PFA-fixed paraffin-embedded sections) analysis of human breast carcinoma labeling ErbB 2 with ab16901.